One of the MANY reasons that I love London so much is because it has the cutest little coffee shops I’ve ever laid eyes on. From pink floral walls to stunning latte art, these cafes are more than just your local coffee joint. 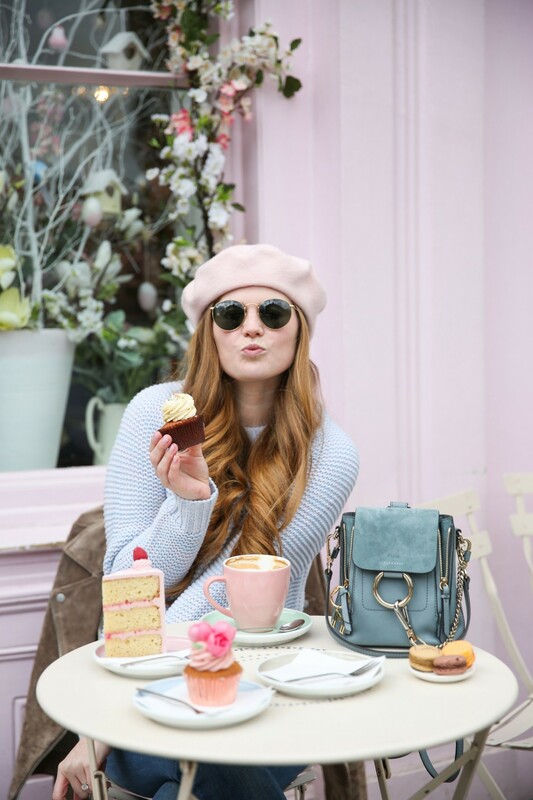 I narrowed it down to my top 5 favorites – be sure to check these Instagram cafes in London next time you’re in town! 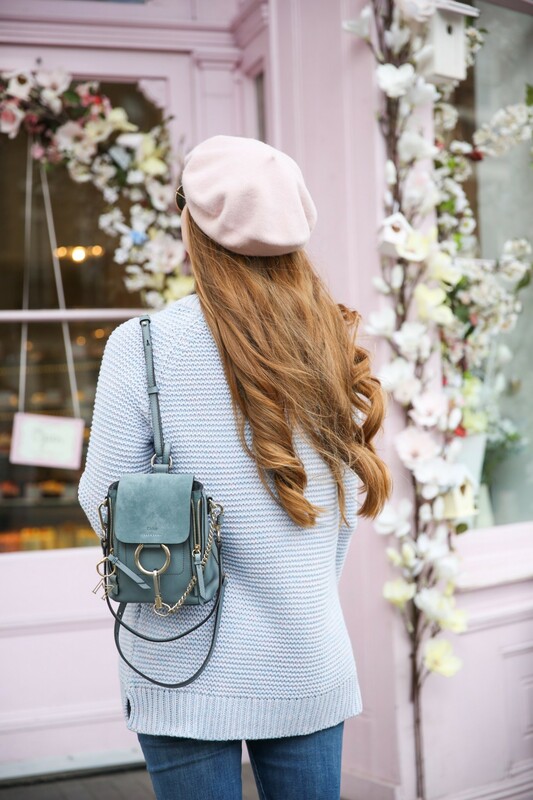 Peggy Porschen Cakes (pictured above): By now we’ve all seen Peggy P’s cute little cake shop all over our Insta feeds. It’s the one with the beautiful pink exterior, crazy floral arrangements, and almost-too-pretty-to-eat cakes. It’s probably one of my favorite places to shoot in London! I would recommend getting there early to get the best shots. Victoria and I arrived right at 10am and there was no one else sitting outside yet. However, she’s told me that theres usually a line these days! Elan Cafe: This is hands down the most millennial cafe I’ve ever seen! There are walls covered in fresh pink blooms, a fantastic menu featuring items like avocado toast and açaí bowls, and cute takeaway cups in everyones favorite millennial pink hue. This is the newest addition to the London coffee shop scene, and it’s crazy busy. I went at 3pm on a Wednesday thinking I would get right in, and the wait was 2 hours long! Needless to say I didn’t eat there, but I did try their pink “Ruby” latte with beetroot and ginger – it was delicious! Farm Girl Cafe: Farm Girl is one of my favorite spots to grab brunch in London. It’s original location is in Notting Hill, but it just opened a brand new Chelsea location as well! Farm Girl is a blogger favorite because not only is the food healthy and delicious, but it’s also beautifully presented. 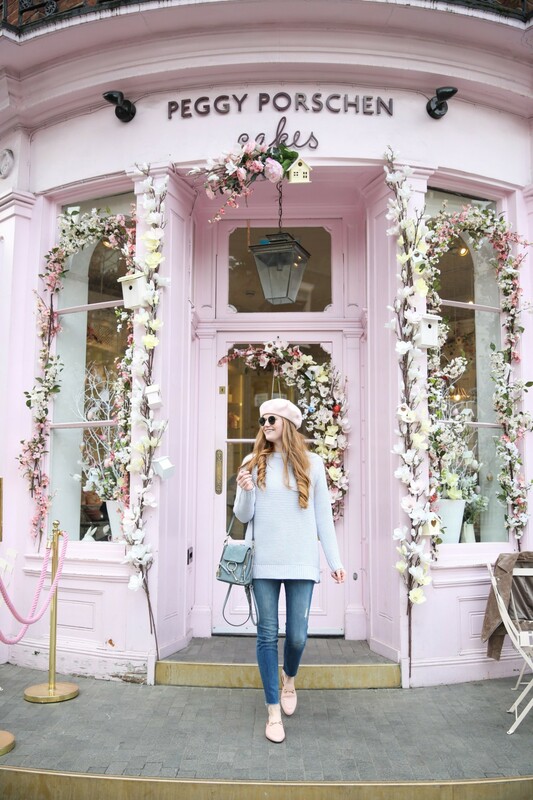 I can’t recommend the rose latte enough – it’s seriously soooo yummy. It gets crowded on weekends, so be sure to come early! 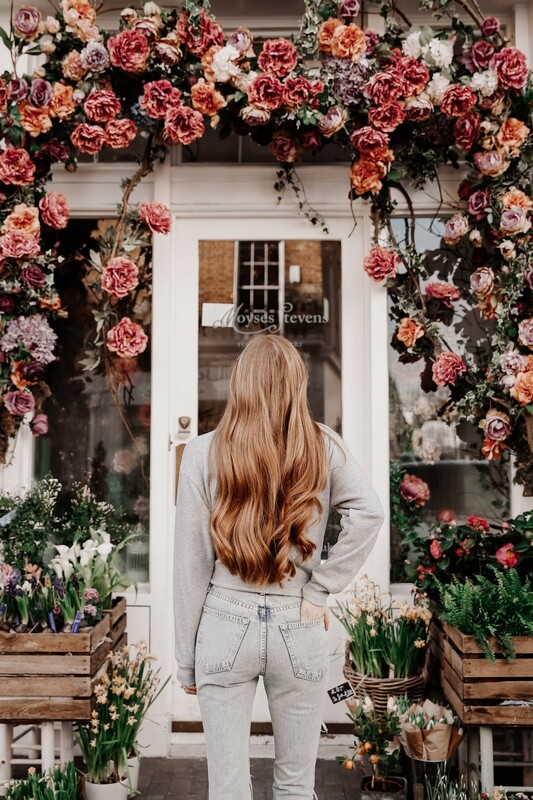 Saint Aymes: Saint Aymes was made insta-famous thanks to it’s gorgeous display of purple cascading florals outside of the store. While it’s mainly a chocolate shop, it does also sell teas, lattes, and other sweet treats. Be sure to try the 23ct Gold Unicorn Latte! 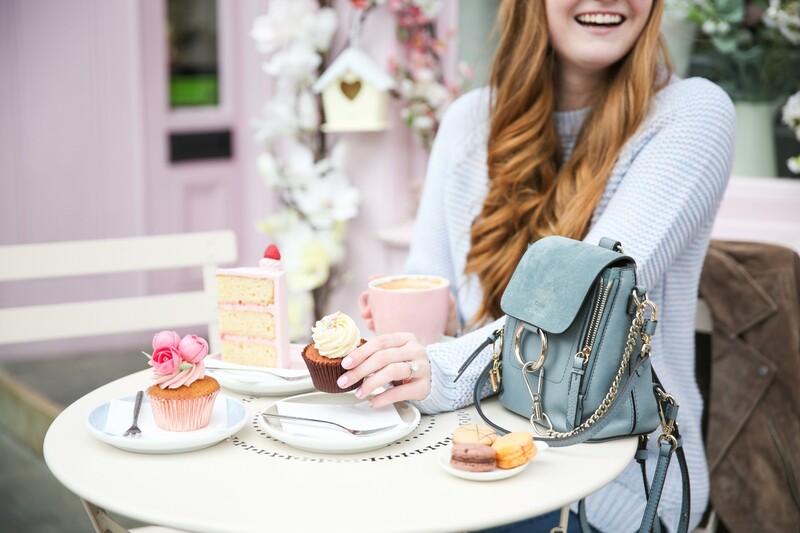 Palm Vaults: This cafe is actually a bit outside of central London, but it made the list because it’s just SO darn cute. It reminds me a lot of Cha Cha Matcha here in NYC – think millennial pink and palm prints everywhere. The açaí bowls and lattes are truly works of art, and delicious too! If you have the time, I would definitely recommend heading to Palm Vaults for breakfast. And there you have it – the top 5 Instagram cafes in London! Which one do you want to visit first?! 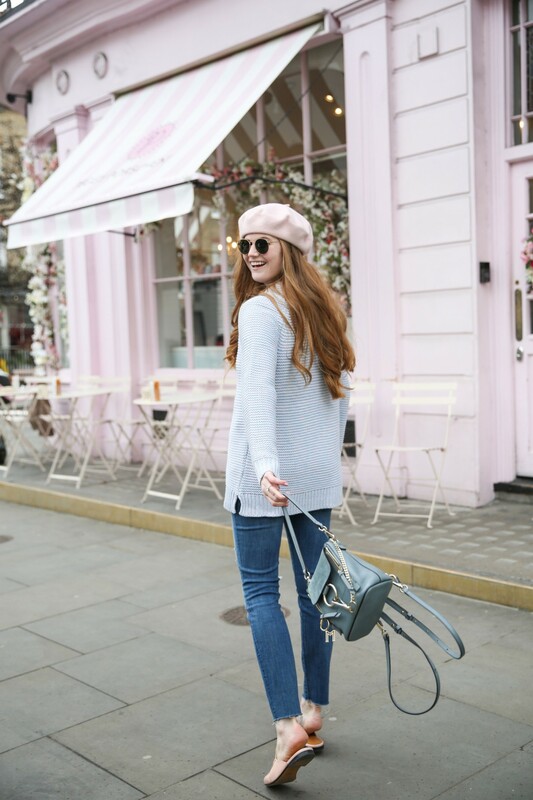 Click here now for more of my London favorites! This photo shoot is the cutest thing ever! I love your outfit and that cake shop looks fabulous. This cafe looks so pretty! 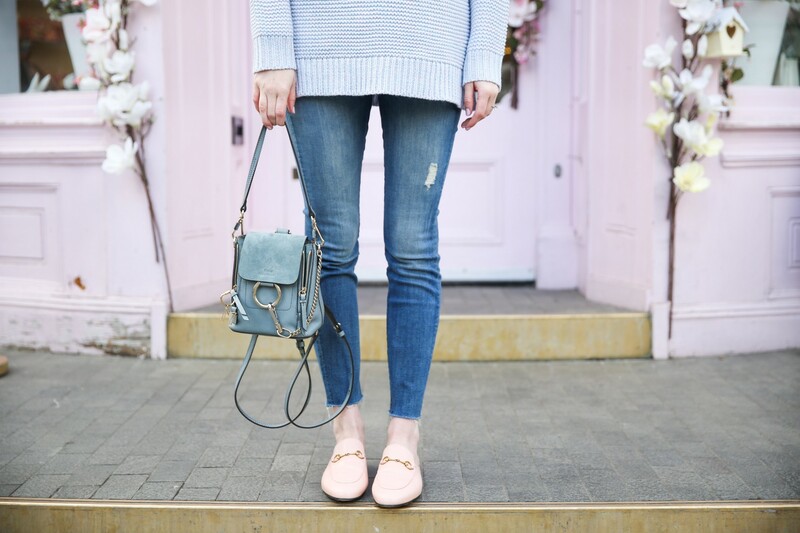 I am also in love with your Chloe backpack!!! Such a great post girl! Will definitely have to save this for future reference!! Love your outfit too, the bag is so cute! 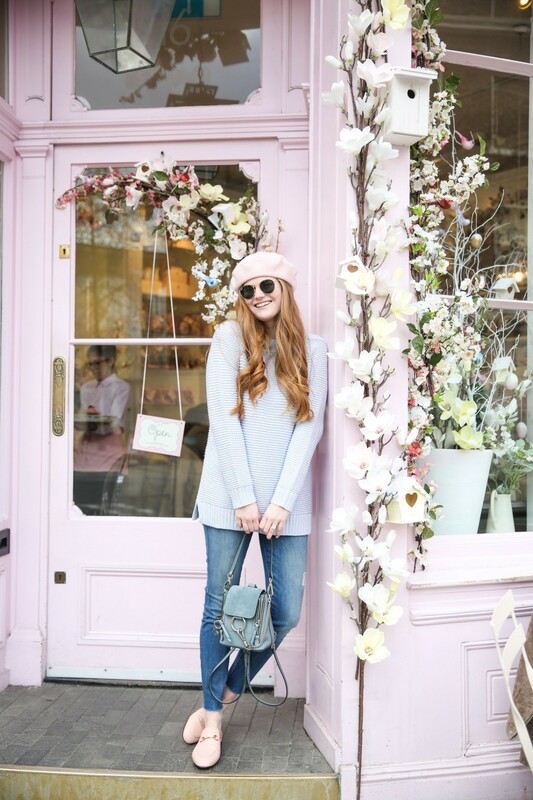 Aaaaaaand now I want to visit London even more than I did previously – just to see these cute shops in person! Peggy P’s has been on my bucket list for ages! There are so many cute cafes and coffe shops in london! Love this one! I definitely want to visit this cafe the next time i’m in london. I love all the pink! It’s freaking beautiful. I need to go to London. Definitly saving this for when i go back to london! All of these photos are adorable! 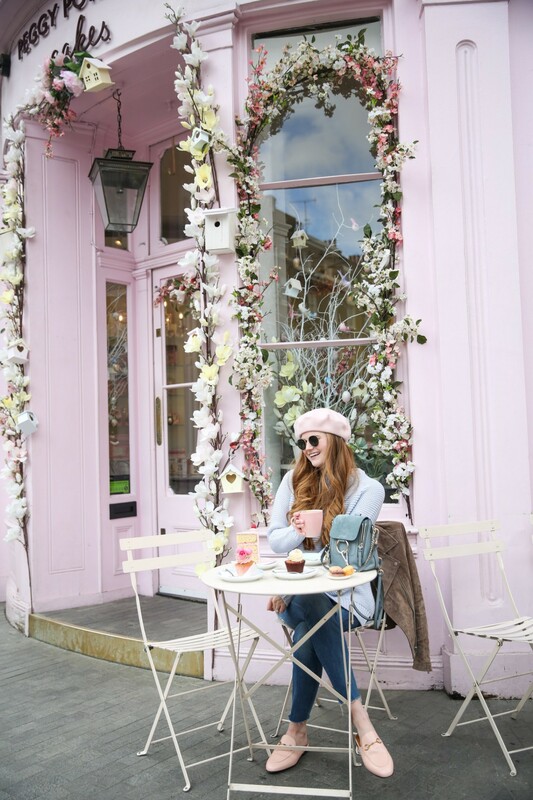 Oh my gosh I wish I would have known about this darling pink cafe when I visited london two years ago! Gorgeous photos!! What a stunning cafe! I am loving your chic outfit too! how fab is that bag? !